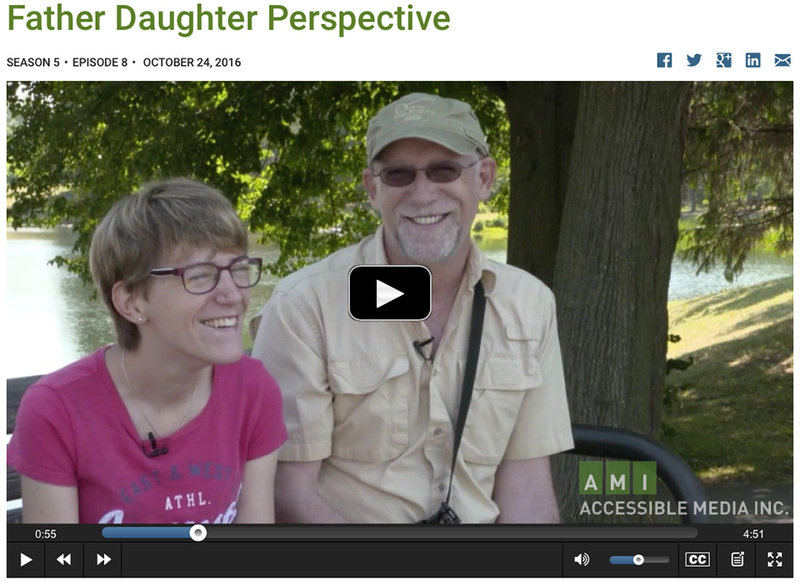 October 28, 2016 – Two years ago, at my ‘What if Weekends’ book launch and exhibit, I unveiled a preview of my next book ‘Father Daughter Perspective‘, that I was planning on publishing with my daughter Caitlin in the spring of 2015. Well, it took a little longer and we published in December 2015. The book has been doing really well, and we’ve even sold a number of Limited Edition prints from the book. We spent the month of June doing fundraising for CHEO – Children’s Hospital of Eastern Ontario and Ottawa Children’s Treatment Centre & Foundation at Sunrise Records – Carlingwood thanks to manager Wendy Rawlings Ratcliffe, and at McDaniel’s Independent Grocer thanks to Gerry & Lisa McDaniel, and we raised over $1200! We’ve been blogged about by Carol Anne Meehan, and interviewed by Carol Anne for 1310 NEWS and interviewed again for 106.1 CHEZ by Cosmo Grant. As a result of that publicity we got a call from Lisa Nault of Accessible Media Inc. asking if we would like to be on their weekly magazine show ‘AMI This Week’, they filmed us at our fundraising at Sunrise Records and again at Andrew Haydon Park doing a photo shoot and then sat down with both Caitlin and I for an interview, all of which was aired October 24th on AMI-tv. If you didn’t catch it, I’ve got you covered, click on the screen capture below to go to AMI’s web site to watch the episode. As a way to mark this broadcast we decided to put a Special Limited Edition Diptych together of two photos we shot at Andrew Haydon Park. This Limited Edition print will be available starting October 24th. Printed on archival paper using archival ink. And of course, books are still available – call or email if you’re interested in purchasing a print and/or book. We also still have a few copies of our Father’s Day Father Daughter Perspective Limited Edition Print of Ottawa’s Parliament Hill and National Art Gallery available, this was a print we created especially for our fundraiser for CHEO – Children’s Hospital of Eastern Ontario and Ottawa Children’s Treatment Centre & Foundation. This print is limited to 10 prints and is available for $100 unframed, including taxes, all the proceeds going to these two great causes..